Fall in love with Saguenay! This region is a little bit like your first love: unforgettable. 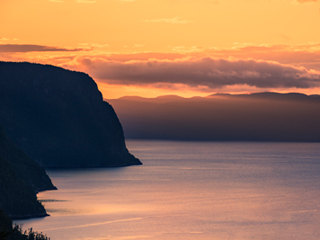 The Saguenay Fjord and its spectacular landscapes are adored by outdoor enthusiasts! On your route, everything from charming inns to four-star hotels to accommodate you during your stay. Urbanites will be right at home in the region’s downtowns with a ton of fine restaurants, show venues and cultural happenings. Awaken the gourmet lover within with fine dining and discovery of the region’s cheeses and food producers, sure to delight foodies! By car, or biking along the Fjord du Saguenay cycling route, they will carry you through charming villages, two of which are part of the Association of the Most Beautiful Villages of Quebec.